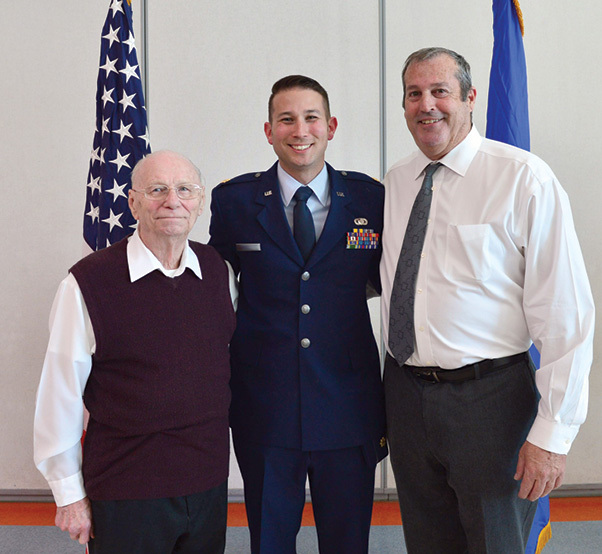 Maj. Phillip, 732nd Operations Group chief of intelligence (center), his grandfather Jerry (left) and his father Patrick (right) celebrate Maj. Phillip’s promotion March 31, 2018, in Las Vegas. Jerry and Patrick have also served in the U.S. Air Force and retired after more than 20 years. As he rolled open his desk drawer to reveal a military patch once worn by his father, Maj. Phillip’s gaze lingered on the 432nd Tactical Fighter Wing emblem in his grasp. His eyes seemed to search for the memories woven between the black and maroon threads before setting it down next to his keyboard. 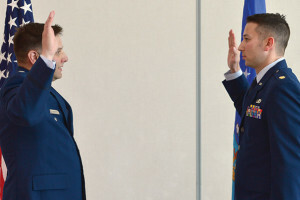 Many families connect through movie nights, snacking on popcorn, rooting for their favorite sports team or singing those 1980s classics, but this major’s family founded a tradition within the years they dedicated to the U.S. Air Force. Phillip, 732nd Operations Group chief of intelligence, is part of a legacy that began when his grandfather enlisted in the Air Force in 1953. Since the beginning of the Cold War, his mother, father and uncles have answered their nation’s call and now get to watch Phillip grow and carry on the more than 60-year-long tradition of military service. Phillip’s grandfather, Jerry, said that the friends he made as an Airman motivated him to not only be a better service member as he took on more responsibility, but to keep an open mind when facing new obstacles. 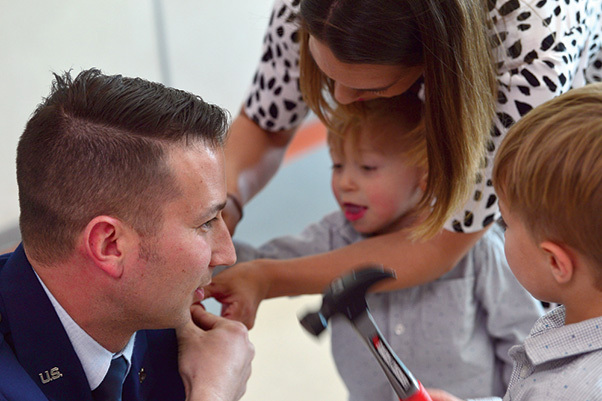 Maj. Phillip, 732nd Operations Group chief of intelligence, gets his rank pinned on by his wife and children during his promotion ceremony March 31, 2018, in Las Vegas. Phillip was surrounded by family and friends who came to celebrate his promotion to major. Over time, Jerry climbed through the ranks, started a family of his own and raised a little girl who would later sign the dotted line herself to join the Air Force. While following in her father’s footsteps, she soon met a man named Patrick. The two fell in love, got married and as years passed, had two children including Phillip. Patrick went on to serve in the Air Force for 26 years with his son Phillip watching as he too gained rank, balanced work obligations with family and influenced the Airmen he would come to lead. When Phillip joined the military and Patrick realized he wanted to continue the family tradition of military service, he was proud to have one more generation that wanted to keep this country safe. Each individual journey began with its own set of expectations but led to shared experiences over the generations. Phillip revealed what an honor he believes carrying the family torch is, and how much he appreciates this chance to serve as his father and grandfather once did. Maj. Phillip, 732nd Operations Group chief of intelligence, recites his oath of office during his promotion ceremony March 31, 2018, in Las Vegas. Though he is a third generation Airman, Phillip is the first generation officer in his family. 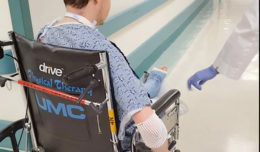 Both Jerry and Patrick expressed how proud they were to watch Phillip experience something they’ve each dedicated more than 20 years of their life to. Today, Phillip is grateful for his ability to serve the Air Force and for everything it has provided his family. Family has been a consistent priority throughout the generations. Phillip looked back on some childhood memories spent with his father and what he learned from those times. “My dad was gone a lot growing up with deployments and Temporary Duties but thinking back on it, he was always there when I needed him,” said Phillip. This, among the many lessons Phillip has learned from his father, is one he wishes to emulate for his own wife and children. “My hope for the future is to be able to be there for my family enough that when they look back on dad or husband being in the Air Force, (they remember) that I was there,” Phillip explained. As he reflected on the countless sacrifices his family has made for their country, Phillip noted the immense pride he feels knowing that he serves the same 432nd Wing his father once served.